There are a number of factors that need to be considered when deciding the best places to set up shop online. While you can try your hand at a number of platforms, we recommend spending most of your time mastering a couple verses spreading yourself too thin. Most gurus and experts you see dominating multiple sites have a team of marketers and assistants to help. Social media can take a lot of time and each platform requires a different level of commitment. To get the most out of your efforts take into consideration the following questions. 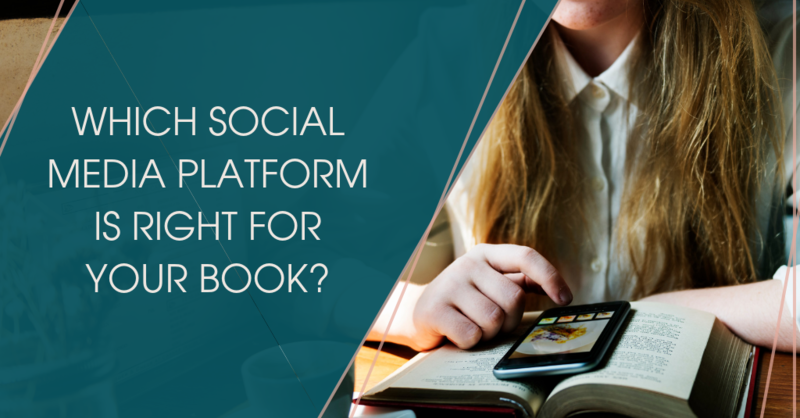 Knowing your ideal reader and where they spend their time is the most important factor to consider when deciding which social media platform is right for your book. You could love Snapchat but if your audience is hanging out on LinkedIn, marketing will be harder. Compare your target audience to key demographics for each social media site to find which your readers are using. Facebook has struggled with negative events and uncertainty over the last year. 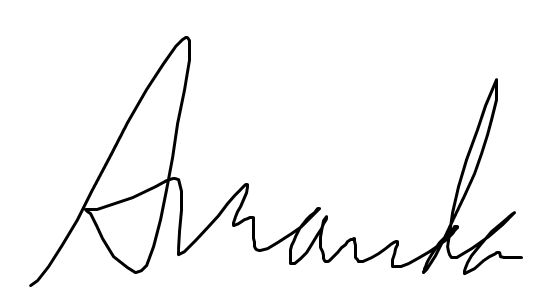 Still, it reigns as king of social media with over 2 BILLION monthly active users. It doesn’t matter how niche your topic is, your audience is on Facebook. While social media users on average tend to be younger, Facebook attracts people of all ages. Having a Business page and a Facebook pixel installed on your website is a good idea for every business. Twitter’s not dead. This fast-paced platform has had an unsteady past but it is the number one platform for live and developing news. It is also one of the most international platforms with almost 80% of all accounts being outside the US. Twitter users are evenly split by gender but tend to have above average income and education. Millennials are most likely to have an account followed by Gen Xers and Boomers. Only 6% of Americans 65+ use the platform. This photo sharing platform recently topped 1 billion users! While it has long been associated with teens and young adults, 131 million accounts are owned by users 35-44. Instagram is more popular with urban dwellers vs rural. Though a college education is common, households of all income levels are likely to have an account. LinkedIn is the #1 channel B2B marketers use to distribute content at 94%. Demographics on the site skew slightly male and much older and more affluent than other platforms. Over 60% of users are 30-65 and 21% are 65+. Forty-four percent of users are also bringing home over 75k a year. It is also a truly global platform with 70% of accounts being outside the US. This is a great platform if you are looking for JV opportunities or work mostly with professionals and other businesses. This mostly female platform (81%) is less social and better suited for content distribution and product sales than audience engagement. The median age for a Pinterest user is 40 but active users tend to be a bit younger. Nearly 80% of pinners say they have purchased a product because of Pinterest. The baby of the social media giants, Snapchat is the youngest platform in terms of its release date (2011) and its average user age. Users 12-24 favor Snapchat above all other platforms and many are using the app up to 10+ times a day. While the platform has recently launched a global marketing campaign, the majority of users are still North American and European. This is a great choice if your topic relates to a young, English-speaking audience. Your goals play a large part in where and how you market your book on social media. If you are looking to work with traditional publishers and agents, a large following on Facebook and Twitter or Instagram are essential. LinkedIn will also help you connect with the right people. On the other hand, if you are looking to drive new traffic to your site content a great distribution strategy is key. Sharing your articles to Pinterest, Tumblr, and even reposting on LinkedIn can put you in front of a new audience and dramatically increase your views. What are your skills and resources? Take note of your existing resources and skills. Strong speaking ability makes you a natural for YouTube and Facebook Live. Photography or graphic design buff? Instagram and SnapChat would be a great fit. Also, audit the time you have available for social media. Especially if you are still in the process of writing a book. Pinterest is my favorite low-commitment platform provided you have a solid blog archive and are producing content regularly. A simple pinnable image takes less than 15 minutes. We use Canva. Make 1-3 for each post and spend a few minutes each week repinning relevant content from others. LinkedIn is another solid choice if you are short on time. Because it has a smaller, more concentrated pool, your content stands a much better chance of being seen than on other platforms. Networking and conversation are central to LinkedIn’s platform. Only those who you are connected with are likely to view your updates and blogs so reaching out and connecting weekly is as important as creating and posting content. That being said, it isn’t recommended to post more than once daily and you can get away with posting less often if you are strapped for time. You can also repost your blog content from your site to LinkedIn to expand your reach and save even more time. Facebook is a bit harder to estimate a weekly time commitment. But you can see a decent organic result (vs paid) without spending all day. If you are looking to optimize your reach and save time, going live on your page once a week is a great strategy. This takes minimal prep, will reach more of your audience than any other content on your page, and only needs to be 10-15 minutes long. Curating content from other sources is another quick, effective strategy and can be done as often as every other day. Use the remaining days to highlight your business, book, and audience. Use a combination of videos (1-5 minutes), images, and text for best results. Twitter can handle the most content of any platform but also has the smallest reach and shortest viewing window with posts lasting only 15 minutes on average. This is also the only platform you can repost content multiple times. Though its best to space them out a few days apart. Expect to post 12-24 times each day for best results, though half of your posts can be retweets and curated tweets. You can also share snippets of content from your other platforms and if you are using it, you can post your Instagram images with summarized text. Being live on Twitter is really important for best results. I recommend checking in often, replying to all retweets and comments, and finding a Twitter chat to engage in regularly if you plan to make this your primary platform. Snapchat is the laid-back cousin of Instagram. Fans are much more relaxed and happy to engage with real-life images here. Though a cute filter never hurts. Feel free to let your hair down a bit and have a lot more fun with this audience. Short, snappy posts are best since they disappear. Best practice is to keep your Snapchat stories long enough to make sense but short enough to keep your audience’s attention. Aim for 5-10 snaps throughout the course of the day. Instagram needs high-quality images for best results. Stock images can be used occasionally for some purposes and text images are really effective but don’t think you’ll get away without using a camera. To save time in front or behind the camera, spend a chunk of time once a week or month taking the bulk of your images. This will help keep your images consistent and on theme as well. It also allows you to edit your images in bulk which can save you hours a week. Curating content isn’t recommended on this platform unless it is extremely relevant to your audience. ALWAYS ask permission to share any images found on Instagram. Don’t forget to write a great caption for all your images. Fans come for the pictures but engage with the captions. 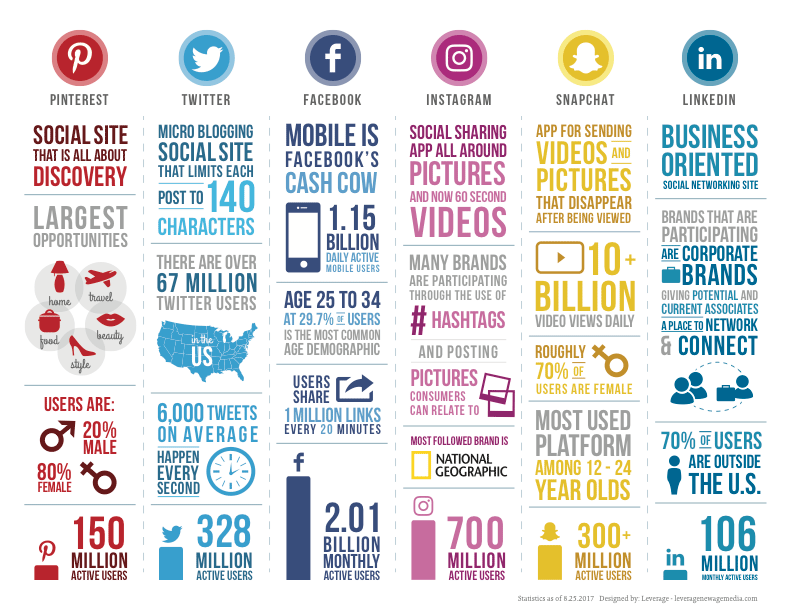 With so many options, deciding which social media platform is right for your book can seem complicated but following the above guide will help you narrow down your perfect fit. Remember to choose one or two platforms that are popular with your ideal audience. Make sure they make sense for your marketing goals and your available skills and resources. Most of all, make sure you enjoy the platform enough to be consistent. Don’t worry about being on a platform you aren’t happy with, even if you hear it is THE BEST. If you don’t look forward to using it, it’s not a good fit. Want more? Check out our Facebook Live talking about this article. Have a question or comment about social media marketing? Jump over to our Facebook and leave us a comment.